Even if you’ve been purposefully ignoring the news, it’s pretty hard to ignore the heightened tensions following the protests and violence in Charlottesville, ending the death of one woman and several injured. Artists across every genre have become increasingly pointed in their political stances and comments, and after a moment like Charlottesville, it’s doubtful that trend will die down anytime soon, especially when you’re talking about punk rockers. 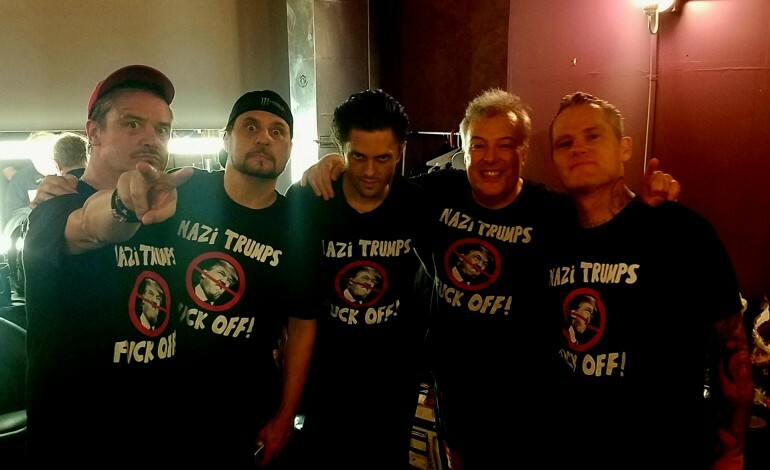 Last night, Jello Biafra joined Dead Cross on stage for an alternate version of the infamous Dead Kennedy’s track “Nazi Punks F*** OFF” entitled “Nazi Trumps F*** Off.” The performance happened last night at UC Theatre in Berkely, CA. Biafra joined the supergroup consisting of Mike Patton, Dave Lombardo, Justin Pearson and Michael Crain to deliver an updated version of his classic punk track. The legendary Dead Kennedys frontman comes on stage and addresses the crowd briefly before jumping into the performance. “Now, more than ever,” he says, “Nazi Trumps f*** off!” The audio quality itself is on the low side, but you don’t need to hear to tell how energetic the performance was for everyone. Biafra looks right in his prime as he performs in front of the supportive crowd. “Make America smart again,” Biafra says as he exits the stage. Along with the remix, each member wore a shirt with the updated title and a picture of Trump’s head crossed out. The political performance follows a few wilder moments during the supergroup’s tour. Less than two weeks ago, members were temporarily handcuffed and detained in Houston, though the causes of that incident are still a mystery. This week, they had to cancel one of their LA dates after a minor skateboard incident involving Mike Patton. The new group is currently on tour supporting their self-titled project released earlier this month.